PLC Training | Scientific Management Techniques, Inc. This Hands-On PLC Training Program is for personnel working with Programmable Logic Controllers (PLCs) who require familiarity with the concepts/uses of PLCs and the unique language they use, Ladder Logic. This program is a must for anyone interested in moving to automation in the production, assembly, or testing of manufactured goods. As with all our training programs, we design our PLC Training curriculum in close collaboration with our global manufacturing clients. This process ensures that the program trains the specific skills required to optimize manufacturing performance and profitability. This is a demand-driven, manufacturing specific training program. The program begins with elementary PLC concepts and progresses into PLC code writing and troubleshooting skills. Due to the Hands-On nature of the program, participants spend considerable time interacting with training aid components and the PLC Program. 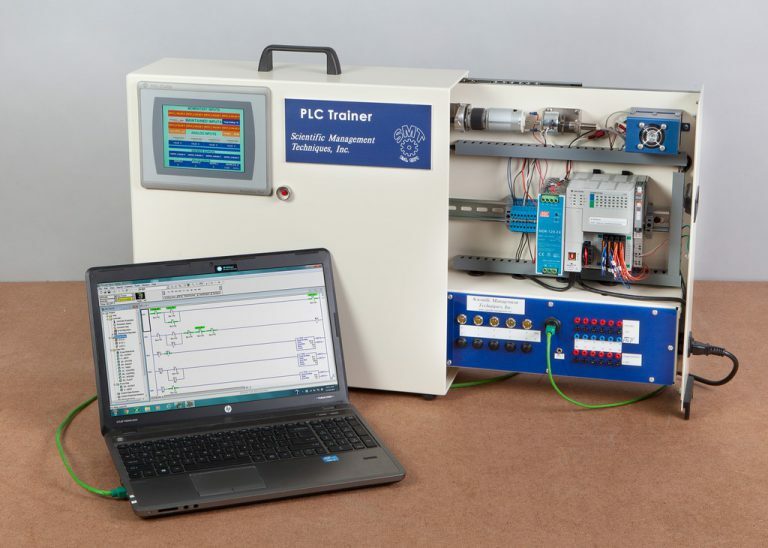 The PLC Training course is for Technicians, Electricians, Mechanics, Maintainers, Engineers, and anyone working with programmable logic controllers. Students should have a basic understanding of electro-mechanical control devices and electrical circuits. Basic electrical knowledge, including the ability to read schematics is desirable. A familiarity with basic computer structure and operation is helpful. Option #1: SMT sends our expert trainers to your facility delivering training to your existing staff and/or new hires. The length of the engagement is a function of training units being delivered and number of individuals being trained. We have delivered training engagements lasting from one day to over a year. A typical engagement is four to eight weeks. In this time frame, we can dramatically increase the skill level of your workforce. You will experience the performance improvement during the training.